Attractive landscaping should consist of more than a lawn. 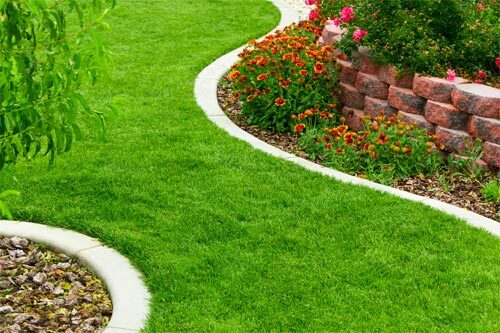 In fact, an attractive landscaping garden can improve the appearance of your house, increasing its value. Most gardens need a focal point, and decorative trees are a great choice. 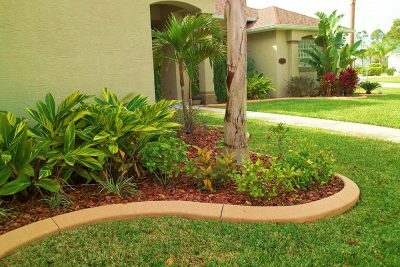 A border adds shape to your landscaping garden and keeps the plants from creeping into your lawn. From there, it’s just a matter of using your imagination. You may already have trees in your yard. In that case, choose an attractive tree with adequate space around it for a landscaping bed. You’ll also want to choose a tree that’s in a prime spot for enjoying the border garden. When choosing an ornamental tree, make sure you have sufficient space for when the tree grows into its maturity. Use a ladder as a prop to help visualize how tall the tree will be at its full height. If you don’t want a tall tree, consider a dwarf varietal or an ornamental shrub. One way to distinguish your planting bed is with a raised border. You have different options in materials, including brick, stone, and metal. However, extruded concrete is a good option for durability and flexibility. Concrete is renowned for being sturdy and low-maintenance. 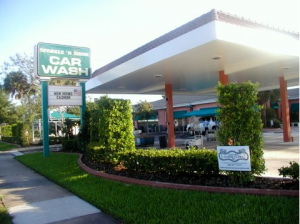 What’s more, contractors can dye and stamp the concrete to resemble other materials. With stamped curbing, you can devise a custom shape. For example, you could have the contractors install a geometric border, or it can be freeform. The flow of your curbed garden should complement the rest of your landscaping. You also get to choose different molds that affect the appearance of the finished curb. You can keep the texture simple, or you can choose one of the more elaborate shapes. Let the style of your house and other hardscaping dictate the mold you choose. You have a few different approaches for choosing your plant palette. You can choose according to a color scheme or a design style. You may choose plants that have sensory appeal or those that are low maintenance. Because you’re designing around a tree, though, make sure at least some of the plants tolerate shade. If you want some full-sun blooms, expand the planting bed layout so part of the garden will always be in the sun. Your border garden will already have a focal point — the tree. However, you may want to add more background for the plants. Landscaping boulders can serve as a good foil for your border garden. You want to choose an odd number of rocks and have them planted in irregular spots for a naturalistic effect. Make sure the rock color is cohesive with your extruding border. Even with decorative rocks and a selection of plants, you’ll still have some ground visible. You could go the practical route and just add mulch. Indeed, wood chips would be an attractive and practical groundcover material. If you’ve opted against decorative rocks, consider pea gravel as groundcover. You have numerous color options, ranging from white-gray to brown-red. You can also select black pea gravel, which would provide a bold backdrop for colorful plants. As with the boulders, make sure the gravel color complements your garden border. Plants are another option for groundcover. You want plants that are low and spread out. They also need to grow well in the shade because of your tree. Sedum, creeping thyme, and spotted dead nettle are likely candidates. Once you have your planting bed bordered and prepared, lay out your plants to get a plan for the design. 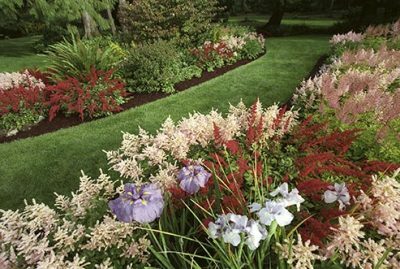 Your beautiful border garden will add unique character to your lawn. Contact Daytona Classic Curbs, Inc., for a gorgeous extruded border.